Spark R&D is the most trusted, most reliable and well known splitboard binding manufacture in the world. Based in Bozeman, MT what makes Spark unique is the company’s ability to R&D just outside their office in the Gallatin National Forest. 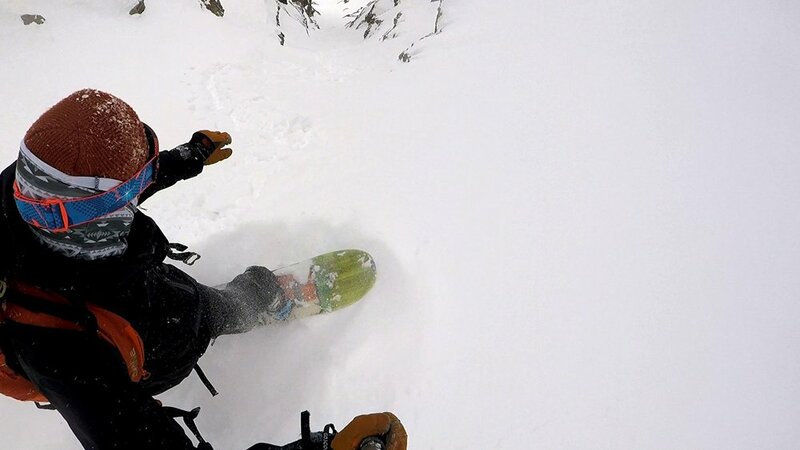 When I got sent a pair of the new Spark R&D Arc Bindings to test I was blown away first and foremost by the straps. One of the things that make this binding stand out and the reason it’s so darn comfortable underfoot is Spark’s use of their new Pillow Line Straps. I have talked about these before in the Surge review we posted recently and I can’t say enough good things about these straps. That being said I have heard from some people that they are feeling foot pain while using these straps? Although I’ve personally never had that happen to me or any of our testers in over a year of testing these bindings. Since we’re speaking of comfort, the Arc Binding is hard underfoot, so it’s recommended that you add the Spark R&D Pads to the binding. 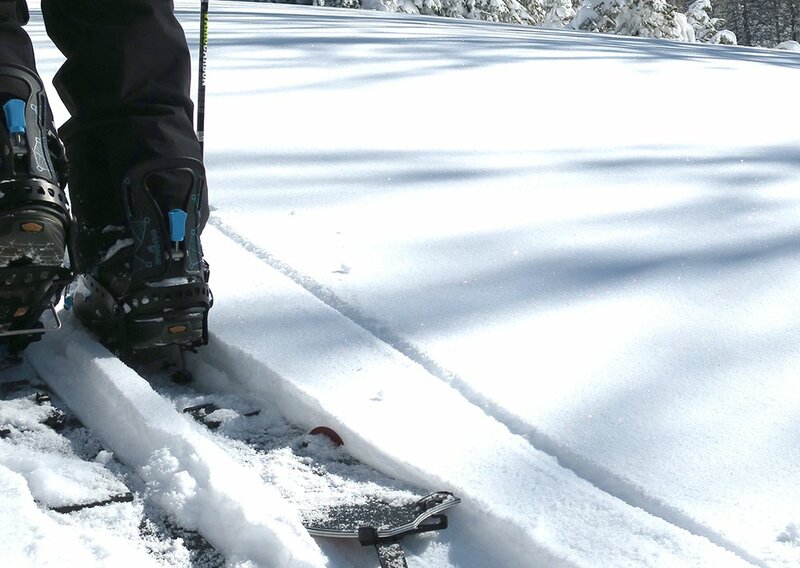 What this does is not only cut down on foot pain while touring but also removes a lot of chatter from the snow up through the board and finally through the bindings. This effect seems to be amplified if using Spark pucks. That is why I prefer the soft plastic of Voile Pucks when using Spark Bindings vs. Spark’s Pucks. I tested the Spark Pucks with these bindings and without. For my style of riding, light and surfy underfoot I was able to tell a noticeable difference between the two and continue to opt for my old Voile ones. Most everyone else I know is on the opposite program and loves the Spark Pucks for their ease of adjustment and tons of different angle options. Pucks aside when it comes to going downhill the Arc Bindings offers a playful and very responsive ride. 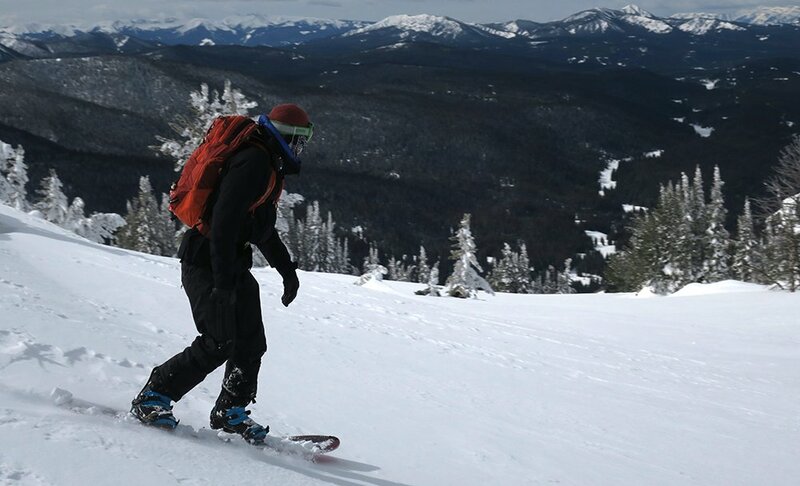 These bindings were designed for riders searching out powder that enjoys quick, nimble on the fly adjustments. For riders weighing a little bit more or looking for a stiffer big mountain splitboard binding Spark R&D also makes the Surge Binding shown below in red. For everyone else, this binding is just about perfect. The Arc Binding is the one you most commonly see on the skin track, a binding that so far has yet to fail that, to be honest, it seems pretty darn bulletproof. Spark R&D makes transitioning from touring to ride mode as easy as can be, without the use of any pins. Instead, Spark uses their Snap Ramp which can be released by simply lifting up on the front of the binding and moving to either side. When it comes to locking the binding back into touring mode the same process is reversed and takes just about the same amount of time (seconds) to lock into place. Once the binding is locked into place in touring mode, it’s foolproof and ready for long tours. When it comes to going downhill the transition is the same as above. The binding comes off and this time the board goes back together. Once the board is together the bottom of the Arc Binding has tracks that easily slide over Spark’s pucks or the Voile ones. Simply slide the binding over the pucks and when it won’t go anymore push the front Snap Ramp down and you now have a binding that is securely in place for the way downhill. This process can be repeated numerous times throughout the day without ever having to worry about the system failing. Clink Clink Clink is the sound the bindings make when you knock them together which makes shedding snow a breeze, especially thanks to Spark’s base cut-out design. 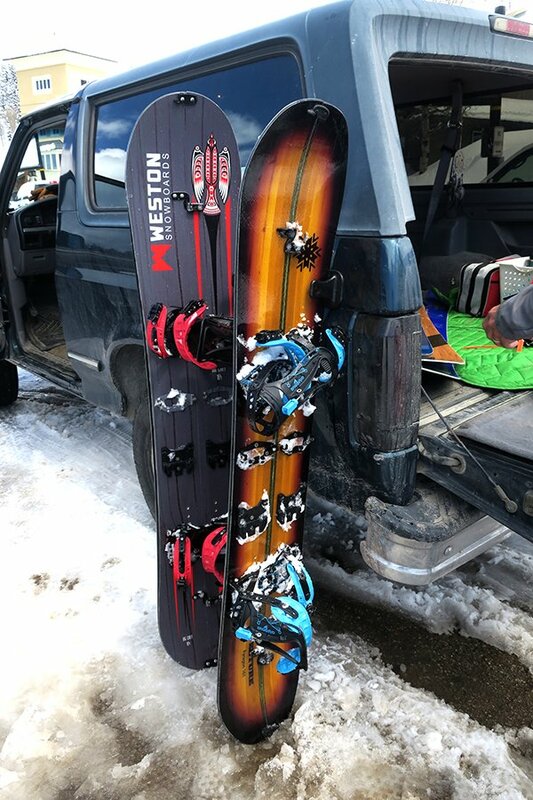 I would not recommend doing this with any of the other Splitboard bindings on the market, especially the carbon ones. In tour mode one of the cool things about this binding, and a feature that took me a few years to finally use is the Rip ‘N’ Flip highback. This allows for extended strides while in touring mode. When you can cut down on the number of strides you make throughout the day you become more efficient. Sort of like running or hiking, you can take baby steps or larger steps. One way is more efficient and faster. Once you tour with the highback extended it will be hard to ever tour with it any other way, especially if you’re the sort of person that enjoys a little bit of forward lean. If you haven’t ridden a pair of Spark R&D Bindings you are truly missing out. 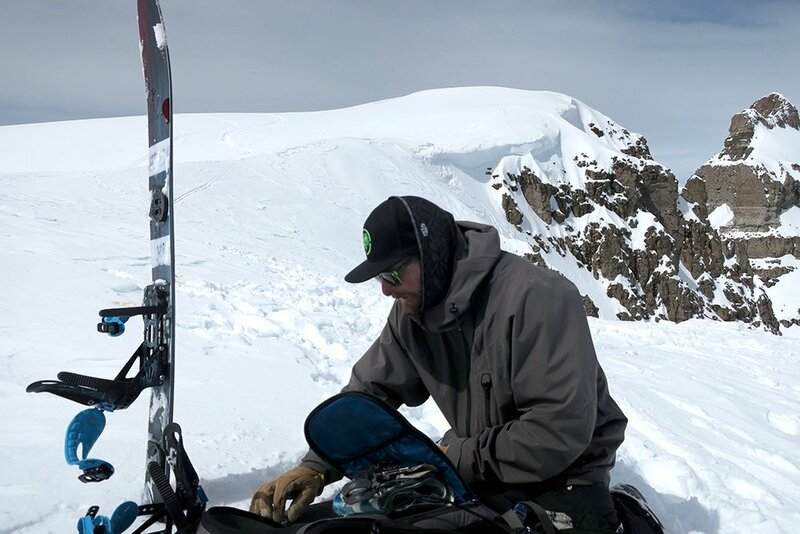 They have made splitboarding popular to the masses and for that, I want to say thank you to Will, Dan, Becca and the entire team at Spark R&D for their commitment and more so for adding tons of stoke to the Splitboard community. 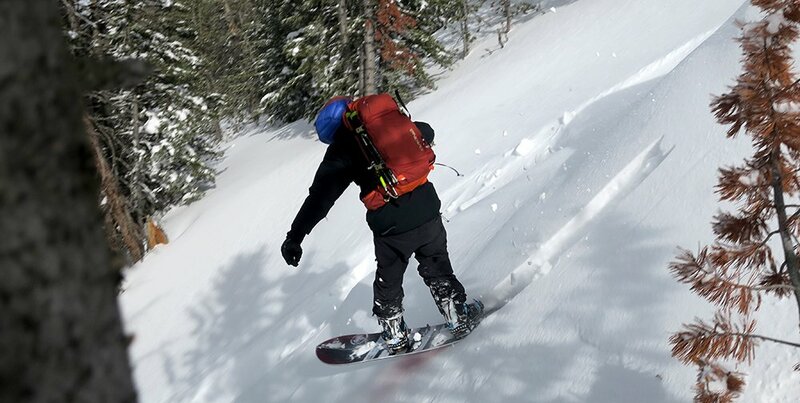 So many people are now getting out in the backcountry, thanks especially to the Spark R&D Arc Splitboard Binding ($385).